In an unusual move by Tehran's mayor, hundreds of copies of famous artworks were plastered on some 1,500 billboards across the city. It transformed the Iranian capital into a gigantic, open-air exhibition. The 10-day project stirred both appreciation and criticism. But whether people liked it or not, the message was simple, according to Ehsun Fathipour. "It says Iranians are art lovers, too," says the 57-year-old Tehran businessman. There was plenty to look at. The art varied from Claude Monet's iconic "Rouen Cathedral", Rembrandt's "Landscape with a Stone Bridge" and Mark Tansey's 1981 work, "The Innocent Eye Test", to the 18th century "Flowering Plants in Autumn", attributed to Japanese painter Ogata Korin. The exhibition ended May 15. In a city of 9 million people, 200 copies of works by world masters vied for attention. They appeared along with 500 works of Iranian artists. One was "Still Life", by Iranian painter Bahman Mohasses. It was in Tehran's Arjantin Square. In Jomhouri Street, just a few blocks from the office of Supreme Leader Ayatollah Ali Khamenei, known for his love of the arts, stood a copy of the 19th century "Indian Fisherman." It is by German Albert Bierstadt. The copies beamed down from the city-owned billboards. They could be seen along key throughways, from overpasses and from main intersections and squares. The project was the brainchild of Mayor Mohammad Bagher Qalibaf. He is a former Revolutionary Guard commander. Twice he has lost his bid to become Iran's president, first in 2005 and then in the 2013 presidential election. The latest time was when he came in second to Hassan Rouhani. Qalibaf has built his reputation on a host of quality-of-life projects around Iran's capital. Parks, expanded subways lines and highways have been built. But he also has faced accusations that he took part in crackdowns against student protesters. Those occurred before he became mayor in 2005. The Tehran municipality sponsored the exhibit. It was entitled "An Art Gallery the Size of the City." The idea was to bring art closer to the city's residents, officials say. The city has sponsored other unusual projects in the past. They include converting a prison, a garrison and a slaughter house into a museum and galleries. Jamal Kamyab runs the Tehran Beautification Agency, affiliated with the municipality. He said the aim was to "improve the artistic literacy of the citizens" and decorate public areas. Tehran-based analyst Saeed Leilaz said the project was likely Qalibaf's attempt to re-vamp his hard-line image. Leilaz thinks Qalibaf was courting the middle class' support, possibly for the next election. Few among Iran's population of 80 million go to galleries and museums. They favor shrines of religious figures and historical sites. From time to time, Iranian artists have also had their works banned. That was apparently for being deemed insulting to Islamic values. In 2010, some 11 bronze statues of Iranian national heroes disappeared. They had been displayed in Tehran's public parks. The statues were never recovered. At the time, officials said religious motives appeared to have been behind the theft. Authorities canceled inauguration of more statues in the city. Movie actor Behzad Farahani told art website Banifilm.ir he saw "at least 20 good artworks ... thanks to the billboards." Pop singer Ali Ashabi said he hoped the idea would be emulated in other cities and perhaps subway stations to "improve people's culture." With a cartoon, the pro-reform Shargh daily newspaper suggested the figure in "The Scream" was horrified at Tehran's often gridlocked traffic. But art critic Reza Simorgh, who writes for the sq72.com news website, said drivers only saw the billboards for just a second or two. He said the distraction could have been a traffic hazard. "It's impossible to learn about sophisticated artwork while driving," he said. Others criticized the low quality of the copies. 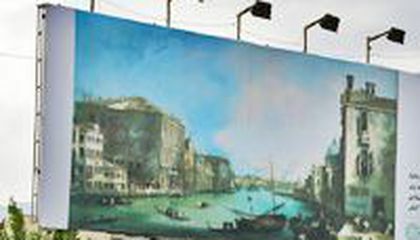 They said the harsh sunlight on some of the billboards did the artworks injustice. Much of Iran's state-owned collection of priceless paintings were acquired during the reign of U.S.-backed Shah Reza Pahlavi. The collection includes pieces by European greats such as Vincent Van Gogh, Pablo Picasso, Salvador Dali and Joan Miro. There also are some by American 20th century icons like Andy Warhol, Jasper Johns and Jackson Pollock. The shah was overthrown by followers of Ayatollah Ruhollah Khomeini during the 1979 Islamic Revolution. Afterwards, most of the art was locked up in the vaults of the Tehran Museum of Contemporary Art. It only rarely emerged for brief public displays. Critical thinking challenge: Why is Iran displaying copies instead of original artworks? Is it easier to name a child than a horse? That is very creative, I would never think to put that right there. It would be a fun thing to look at while your driving. This is actually a pretty cool idea, because tourists who come for art exhibits can see it just driving down a road. So good job! This is a good idea. Just display copies on roads instead of original copies that cost a lot of money. That will save tons and the government might make tourist money as well. I totally agree with their idea. This is a very cool article. I think this is a very cool way to make Iran look super cool, fun and artistic. That's really cool how artist put up those really awesome art on some billboards. The artist made the city look like an air-open exhibition. I'm glad those pieces of art are put up on those billboards. I think that it is cool for this man named Iran to display copies on billboards just to impress people who are driving to work because most of the time, I think that Iran wanted to do to impress more people across the whole entire city highway just to impress a lot of people that are driving to work. If Iran is displaying copies of famous paintings that are now displaying on billboards so that people are going to be impressed by the famous painting from artists a long time ago. Critical Thinking challenge (CTC): Why is Iran displaying copies instead of original artworks? Answer: Iran is displaying copies instead of original artworks because it it is put up instead of original artworks are going to take a long time to paint the painting of something. Wow the Iranian people would love the artworks hanging in the street because I would be happy if there were artwork hanging in the streets because I get to see all the beautiful artworks they are hanging everyday making me feel better because I really don't know why but seeing artworks make me feel better. But it is also a bad thing because the driver could get too attracted to the artwork that they are just looking at the artwork without seeing where they are going so they could get into a car crash. This article is about Iran. 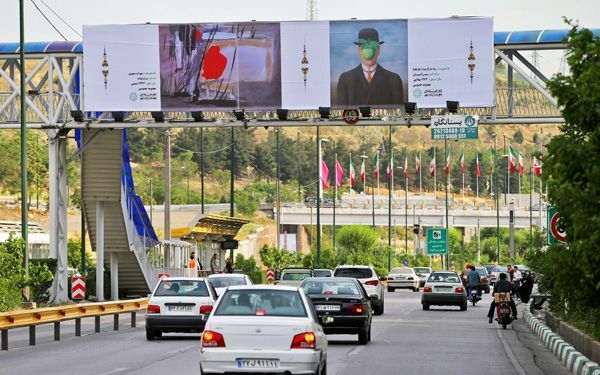 Iran put billboards of famous artwork to liven up the city. People gathered to see the new postrs that were put up. I think this a good way to liven up the country. I think that its a great idea to put up art work in a city because it will attract more people to the city and they will buy stuff so people get money. I like the art on billboards thy are cool looking. I wonder why the city let them do that. I would let them but that wastes billboards for advertisement.